Rose Mary Schmid, 84, of North Syracuse, died Saturday, August 11th. Rose Mary grew up in Eastwood where she graduated from Eastwood High School and resided in North Syracuse for many years. She was the daughter of the late George and Rose (Schilling) Schmid. Rose Mary or "Aunt Rosie" to many, helped run the family business, Travelers Motel. She retired after 27 years working in the mortgage department at KeyBank of NY. She went on to work for Equitable part time. Rose Mary enjoyed golfing, bowling and knitting. She made afghans for the members of her family and later, hats for the newborns at St. Joseph's Hospital. She was an avid photographer filling many scrapbooks with her travels and family. Rose Mary traveled extensively throughout the world during her later years. She was a communicant of St. Margaret's Church in Mattydale and a member of their choir for many years. Rose Mary is survived by her Irish twin sister and brother-in-law, Anne and Phillip Prell of Liverpool; her nieces and nephews: George (Chantal) Prell of NJ, Kathleen (Heinz) Friedman of Batavia, Steven Prell of Liverpool, Roberta "Robyn" Prell of Liverpool, Kenneth (Linda) Prell of Lakeland, and Edward (Shawn) Prell of North Syracuse; and many great nieces and nephews. 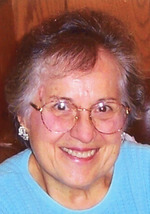 Contributions in Rose Mary's memory may be made to St. Margaret's Church, 203 Roxboro Rd., Mattydale, NY 13211. Friends may call on Sunday from 1 - 4 pm at Krueger Funeral Home, 2619 Brewerton Rd., Mattydale. Prayer Services will begin on Monday at 9:30 am at the funeral home followed by a 10:00 am Mass of Christian Burial at St. Margaret's Church. Entombment will be in St. Mary's Mausoleum, Dewitt. To send flowers to the family of Rose Mary Schmid, please visit our Heartfelt Sympathies Store.